Welcome to a special announcement to subscribers of Right Writing News. If you are reading this issue forwarded from someone, be sure and use the link below to get your own free subscription. Discover The Secrets To Getting Published With Acquisitions Editor Terry Whalin, author of "Book Proposals That Sell: 21 Secrets To Speed Your Success!" 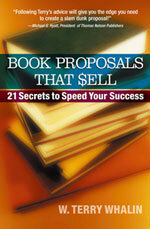 Teleseminar: Did you know that over 80% of all nonfiction titles sold are sold from a book proposal? A book proposal is essential to getting your book published yet, many authors have questions about how to create a book proposal that actually sells the book! What Do Acquisitions Editors Want? Terry Whalin Reveals EVERYTHING! ** How to get the acquisitions editor's attention and lots more! All who sign up are offered a complimentary publicity CD: How To Create A Media Friendly Book Packed With Segment Ideas & BUZZ! About Terry Whalin: W. Terry Whalin knows and understands both sides of the editorial desk--as an editor and a writer. He is the Fiction Acquisitions Editor at Howard Publishing Company based in West Monroe, Louisiana. He worked as a magazine editor for Decision and In Other Words magazines. His magazine articles have appeared in more than 50 Christian and general market publications plus he's written more than 60 books. A journalism graduate from Indiana University, Terry writes a wide spectrum of subjects and topics for the magazine and book marketplace--from children to teen to adult.